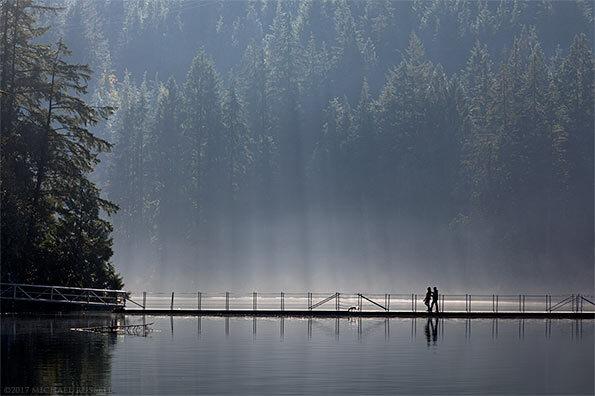 Two hikers walking over the floating bridge at Sasamat Lake in Belcarra Regional Park – Port Moody, British Columbia, Canada. 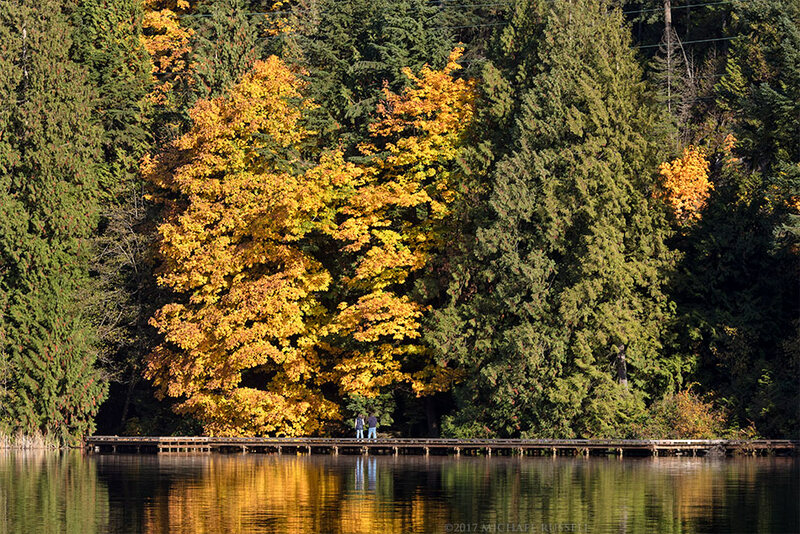 One of my destinations for fall foliage this year was the Buntzen Lake and Belcarra Regional Park areas of Port Moody, BC. I hadn’t originally intended to stop at Sasamat Lake, but when I saw the sign at the turnoff I headed that way as it wasn’t very far to drive. Sasamat Lake has had a few names over the years, but was renamed Sasamat in 1941 as it was rumored to be the local aboriginal word for the nearby North Arm of Burrard Inlet. I stopped by the roadside at one end of the floating bridge and walked down to the water to see if there was any fall leaves to photograph. Most of the color was in this one large Bigleaf Maple tree, but there were some other smaller ones around as well. 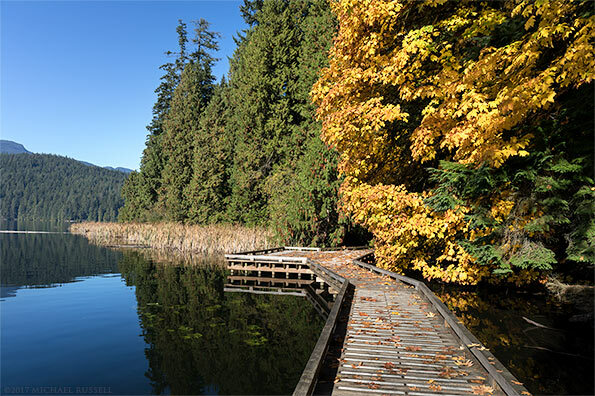 This first photograph shows the view from the boardwalk (along the Sasamat Lake Loop Trail) on the east side of the lake looking towards the floating bridge. There was a lot of mist and moisture in the air and this created some interesting views looking into the sun. 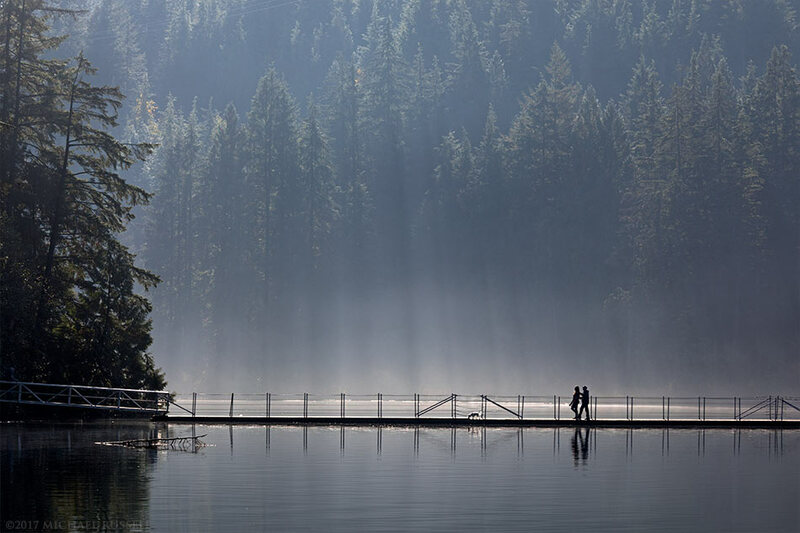 I made this photograph with one of my longer lenses of two hikers crossing the floating bridge with their small dog. I am not sure if the lines formed by the sunlight are from the tree tops or the power lines above, but I enjoyed the effect regardless. The second photograph here was shot from the west side of the floating bridge. The fall foliage colour on this particular Bigleaf Maple was so bright you could watch almost every person walking by stop and enjoy it. This couple stood there for probably 5 minutes, which made it easy to get a photo I liked of them viewing the leaves. During my university days at SFU I went on an optional field trip in my Limnology class to this floating bridge. We were taking various temperature readings, Secchi depths and other measurements. I had ventured down the bridge a distance from the main group when a bus load of Japanese tourists walked onto the eastern side of the bridge. Once it was discovered that I was engaged in some scientific activity they all insisted on taking individual photos with me. Selfies – long before they were called such a thing (and with film cameras). This puzzled the rest of my biology group but it would probably allow me to put “internationally famous scientist” into my bio if I were into that sort of thing. Sasamat Lake’s main attraction is White Pine Beach, which is situated at the northeast end of the lake. Sasamat is one of the Metro Vancouver areas warmest lakes, so that probably explains some of this beaches popularity. The nearby Buntzen Lake is very cold even on a hot summer day! I didn’t walk all the way to the beach along the Sasamat Lake Loop Trail, but did go as far as this wooden boardwalk next to that one Bigleaf Maple tree. 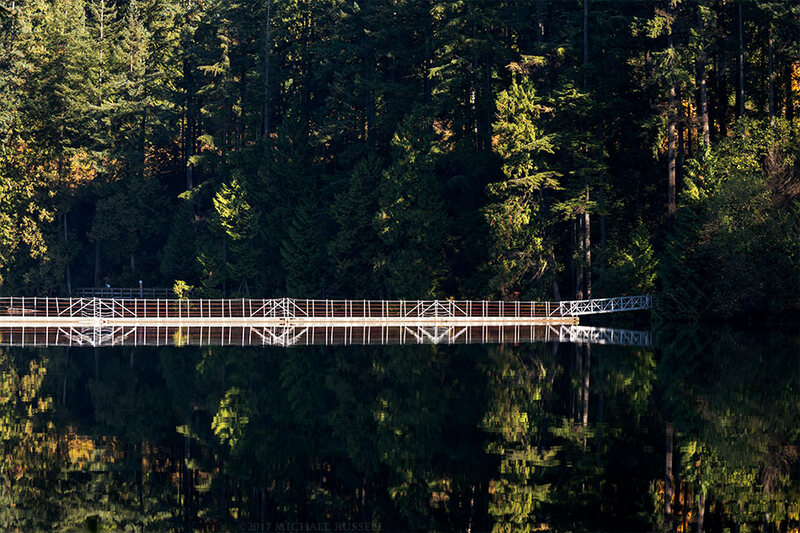 This day was relatively calm and this gave the opportunity for this reflection photo of the floating bridge over Sasamat. One of the few times that afternoon there were no people walking across it. 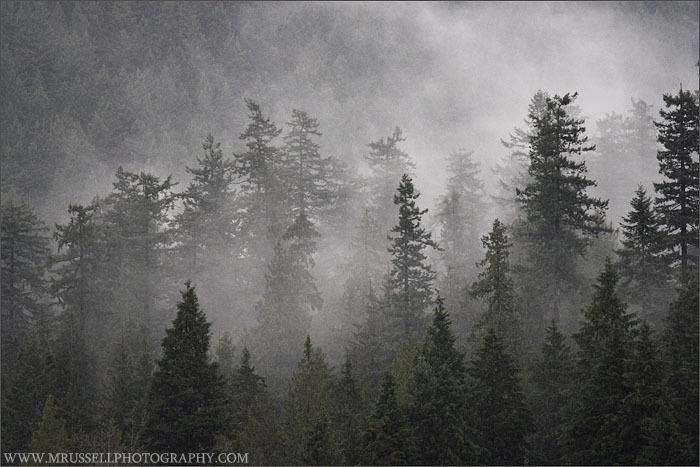 For more photographs of the Port Moody area visit my City of Port Moody Gallery.